Hey y'all. I love the weekend. Don't you? My husband is home and we get to hang out. I get to cook good food with no rushing. Vegging on the couch and napping is no longer prohibited like it is during the week. Catching up on my favorite blogs and YouTube videos is always on my list for a relaxing weekend. I love the weekend. Being a 'misplaced' Texan in Illinois causes me to want to spend the whole day outside since it has finally reached 80°. I can begin to thaw from the winter that I was NOT used to and thought was never going to end. J and I woke up and had breakfast and then took Ellie on a nice long walk around the neighborhood. 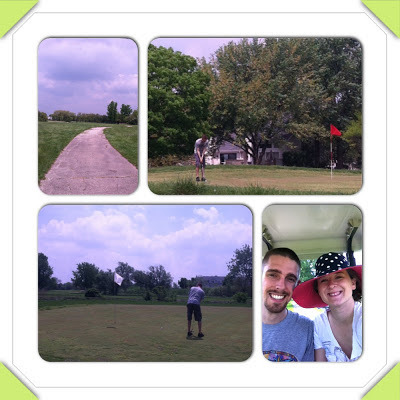 This next part is exciting...we went golfing. I don't really know if you would call it golfing. It was more like smacking the little white ball then searching/losing it in the trees. It was really fun to hang out together, laugh and drive the golf cart. Now, let's talk food. J's favorite food is anything Italian, but particularly Chicken Parmesan. I made a little Chicken Parmigiano Reggiano for my darling on Saturday night, but I am most proud of the roast I cooked for Sunday lunch. Our apartment smelled so good when we came home from church! Roast. Potatoes. Carrots. Yum. The countdown until Memorial Day weekend has already begun. I haven't had chicken parma in years - might need to rectify that soon! Sounds like me playing golf, although Chloe is great at it! Thanks for the reminder that we need to get back out on the course so she can finally teach me how to play since, as you mentioned, it's finally bearable outdoors!! What a winter, ugghhh!!! Thanks for stopping by popcosmo and hope to see you around again!!! I love chicken parm!! And most Italian foods!